Myanmar has been making efforts in combating human trafficking, claiming that it has rescued over 1,000 trafficked victims in four years' period since 2005 when the country's anti-human trafficking law was introduced. More than 1,100 traffickers were also exposed in connection with 400 cases of its kind, according to the Home Ministry's Central Committee for combating human trafficking. Those who were repatriated from Thailand are the majority, followed by those from China, Malaysia, Japan, Bangladesh, Jamaica and Singapore as well as China's Macao and Chinese Taiwan, the home ministry's figures showed. The government has so far built eight rehabilitation centers offering educational programs and vocational skill training for the returned victims. In 2008 alone, the Myanmar authorities reportedly rescued 203 victims, punishing 342 traffickers in connection with 134 related cases. Meanwhile, Myanmar in cooperation with non-governmental organizations has developed information networks at highway terminals in Myanmar second largest city Mandalay to curb human trafficking undertakings centered in the city. 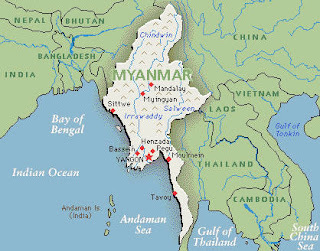 Mandalay has been exposed as the country's internal human trafficking point and used as a transit center to reach border areas along the trafficking route of Mandalay-Pyin Oo Lwin-Lashio-Muse to other countries. To facilitate the repatriated victims, Myanmar is also planning to set up temporary care center for them in Muse with the help of GGA organization of Japan. According to the report above, the country has demonstrated its sincere efforts to fight against human trafficking, including victims' assistance. Earlier this year, China and Burma announced their joint anti-human trafficking effort through a film shooting. Burma also closed a Memorandum of Understanding with the Thai government in an effort to decrease the country's rampant human trafficking to Thailand. On the other hand, the military junta increased the number of child solider in an efforts of securing public order before the upcoming election to be held in 2010. The family of child soldiers receive food and money at the expense of their children's military service.